Last week I talked about why you should avoid selling traditional art. I gave tips and I’m adding to it this week with three additional ideas. 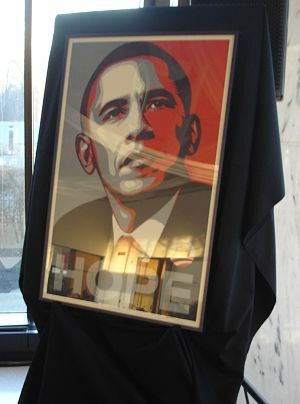 In 2009 at a more liberal school auction, I sold a signed print of Frank Shepard Fairey’s iconic HOPE poster for $2500. It was so popular, I was able to sell it three times, earning the school $7500. Just 30 days prior to that auction, I worked at a conservative school fundraiser. An item had been — the auction chair believed — intentionally damaged because it had President Obama’s image on it. This brings home the challenge of politically-themed art. There’s a chance that at least 50% of your audience will immediately dislike it. 4. Suggest a signed and numbered print. If you aren’t getting an original piece of art (and you usually won’t), it helps to have the piece signed and numbered. I doubt the HOPE poster of President Obama would have brought the value it did had it merely been a poster and not signed by the artist. 5. Think twice before framing. Framing is good for art, but the challenge is that framing is so expensive. An additional $300 of framing might never be recovered in the sale of the item. Although I prefer selling framed pieces, I advise against it unless the framing is deeply discounted or free. Some final thoughts for my art center clients who have traditionally only sold art in their benefit auctions. In many cases, an art center’s mission is to promote art to the larger community. These centers remind us that art enriches our culture, reminds us of our humanity, and is a valuable, tangible creative expression. It’s not necessarily to support *this* art style or *that* artist, but to support art in general. Consider expanding on that theme in your items. Sell an art vacation. It might be a first-class trip to Miami Art Basel or transportation and lodging to Burning Man (Can you imagine!). Sell a one-on-one instruction with a professional artist at The Torpedo Factory. Is there a restaurant in the city which has collaborated with an art center to rotate artwork on the walls? Secure a dinner for two where guests can enjoy culinary delights on the table, and artistic delights on the walls. The auction is your opportunity to remind art-loving guests that art is meant to be experienced in a multitude of ways, and can be brought into many aspects of our life to enrich our experience as humans. Use your items to remind guests that art is meant to be appreciated with all five senses. Great ideas. I have to agree about framing. People can be pretty picky about frames, myself included. It depends on the type of artwork but a frame just for the auction would help in selling it. If you are doing numbered prints, then that makes it easier. You can just get the one on loan and sell the auction items unframed. I have mixed feelings about the political issue. Despite the current state of the media and politics, the office of the president should be respected. Not everyone would want a print of one president or another but I think to banish anything remotely political is too, well to be redundant, politically correct. (Perhaps your auction was prior to the election.) Your point about knowing your audience however is well taken. And regarding framing … sometimes I’ll see a little note that says, “Frame is NOT part of donation.” They showcase the art in the frame, but make it clear it’s not going home with the buyer.